Rather than following Ozma Wars’ lead and making use of another company’s technology, Sasuke vs. 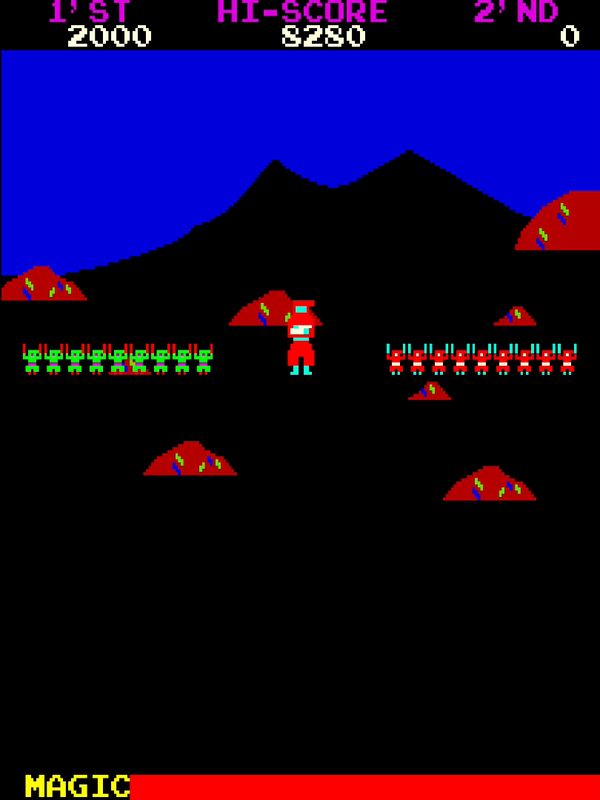 Commander was one of the first games to run on SNK’s 6502-based “Rockola” hardware. This would later go on to power titles such as Fantasy and Vanguard, both of which are also present and correct in the SNK 40th Anniversary Collection. The Rockola hardware had some notable advantages over the earlier Taito 8080 hardware that Ozma Wars had run on, the most significant of which was the addition of colour to the display. This allowed Sasuke vs. Commander the opportunity to display vivid, vibrant graphics, and also to include more detail in its various elements. It’s certainly a striking, eye-catching game, with its bright whites, reds, yellows, greens and cyans starkly contrasting against the mostly dark backdrop. In Sasuke vs. Commander, you take on the role of Sasuke, who is in charge of protecting his lord, the Shogun, from “NINJA”. 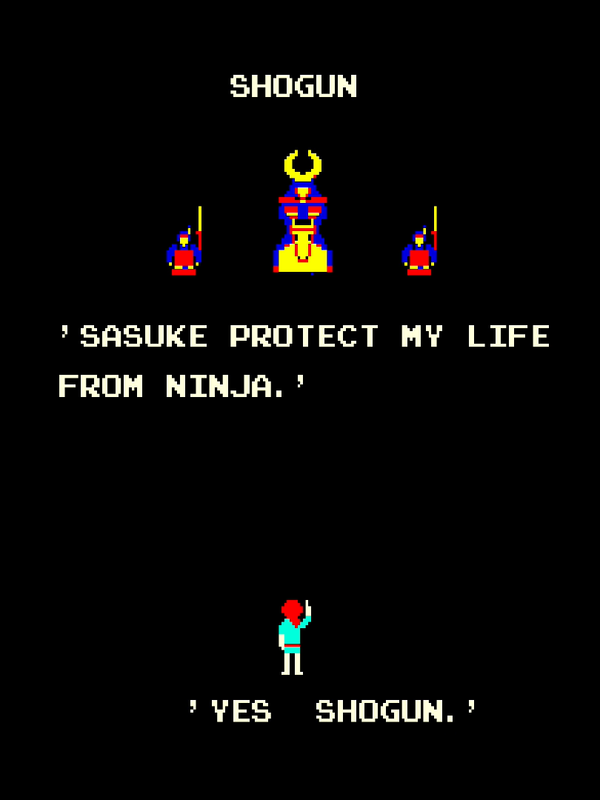 The broken English of the introductory screen for the game — one of many firsts in Sasuke vs. Commander — seems to imply that there may only be one NINJA to battle against, but in fact there are many ninjas. The battle begins with Sasuke, represented as an enthusiastic young redhead with an aversion to trousers and shoes, coming under siege from a… what’s the collective term for a group of ninjas? A diminishing effectuality? Let’s go with that, with full apologies to Casey Bisson for shamelessly stealing his excellent joke. Sasuke begins his mission under assault from a diminishing effectuality of red ninjas, who leap from the hillsides and trees depicted in the background with callous disregard for the rules of perspective. 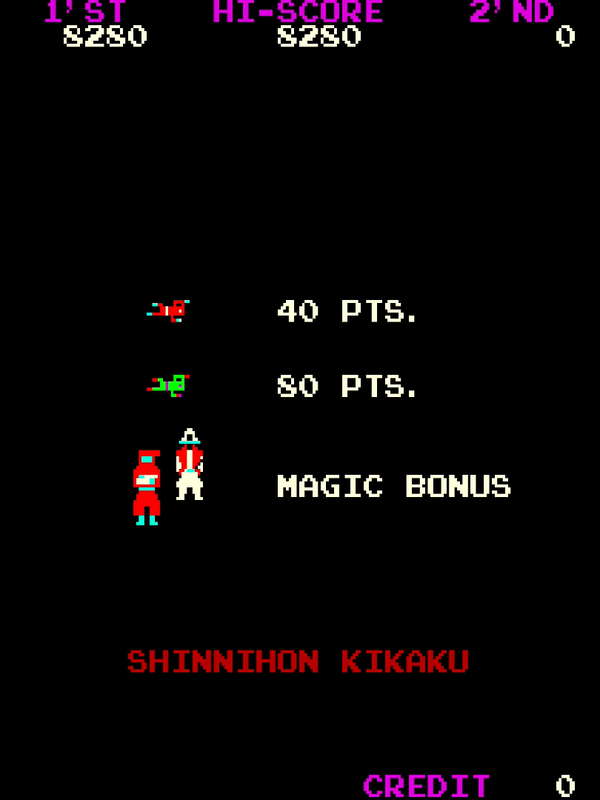 He can run left and right and fling knives up the screen; meanwhile, the red ninjas can bounce off the sides of the screen, throw shuriken and occasionally disappear, only to reappear somewhere else. Upon blasting your first ninja, you will notice another “first” for Sasuke vs. 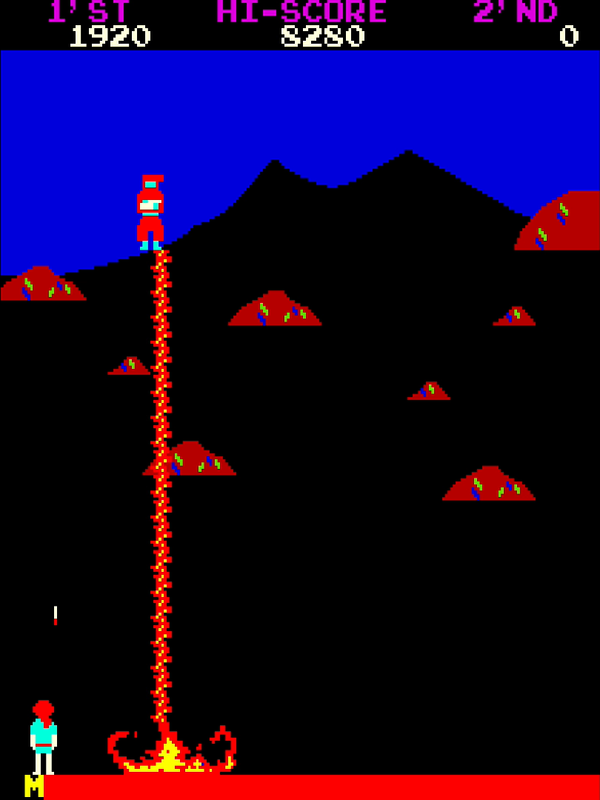 Commander — possibly the very first example of a “suicide bullet” in a shoot ’em up. Well, kind of; upon dispatching a ninja with a well-aimed knife, said ninja will then plummet to the ground as an indestructible corpse, flattening poor Sasuke if he happens to be in the way of the falling cadaver. In other words, after making a successful kill, you better get out of the way — and you should probably try and kill things a little further up the screen to make things a little easier on yourself! Upon dealing with all the red ninjas, you are then confronted with their friends the green ninjas. These likewise leap from the trees and hillside, but this time they wrap around the sides of the screen as well as performing the occasional teleportation act. They, too, attempt to humiliate you by inconsiderately firing their corpses at you after being on the receiving end of a sharp and pointy, and likewise must be avoided. After you’ve dealt with all that — assuming you survived the onslaught, which is no mean feat on your first couple of attempts — you’ll be confronted by what is suggested by some to be the first ever example of a boss in a video game, and certainly one of the first to specifically be referred to as a “boss” in the promotional literature. The ninjas, it seems, are commanded by… well, commanders, and each of these commanders has… command over a particular element. After an epilepsy-inducing flash of lightning, your opponent will babble something presumably relevant in teeny-tiny kanji characters no more than 8 pixels high (the use of kanji being yet another “first” for Sasuke vs. Commander) before attempting to obliterate you using frankly rather unfair tactics that vary according to the colour of the commander you are currently facing. Thankfully, unlike later iterations on the concept, Sasuke vs. Commander’s bosses only require a single hit to dispatch, so it’s all a matter of careful positioning and timing, and occasionally swearing at the discovery that the various things the bosses blast at you completely block your own shots. You only get once chance, though; if the boss defeats you, you’re treated to him being rather smugly flanked on either side by tiny red and green ninjas doing a rather patronising little dance, and deprived of a bonus. Conversely, if you do manage to get a lucky shot in, you receive bonus points according to how much is left in the “magic bonus” timer bar at the bottom of the screen while all this is going on. After such an encounter — and assuming you have lives left — the cycle repeats, but harder, and with a different commander to take on after you’ve dealt with the red and green hordes. You then continue until you have no more lives, at which point Sasuke suffers the ultimate indignity — running away, tripping over a small pebble and apparently being too embarrassed to ever get up again. Sasuke vs. Commander is fun. It’s simplistic, sure, but it has a sense of personality and light-heartedness about it. 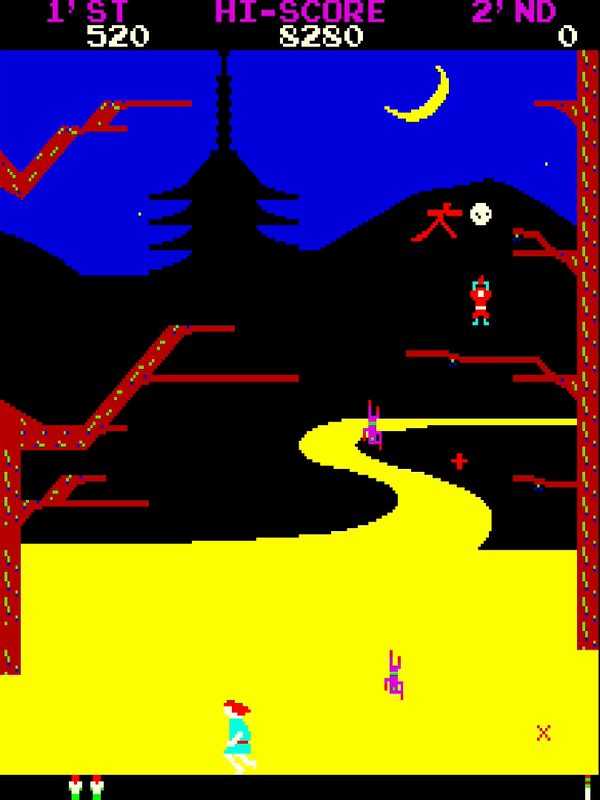 A big part of this comes from the colourful graphics and the silly animations — particularly Sasuke’s aforementioned “game over” animation, which is sure to raise a chuckle the first time you see it — but also from the sense that there’s clearly some thought been put into the mechanics, learning from the mistakes Ozma Wars made. There’s no way to get yourself into a “loop of death” as in Ozma Wars, for example, as the stage resets itself after each life is lost. The return to a conventional lives system is welcome — as is the ability to earn extra lives at relatively low score milestones. And the boss fights can’t act as a roadblock to continued progression — regardless of whether you succeed or fail at them, you continue on with the game, so long as you have at least one life remaining. Okay, you still have to deal with the inherent limitations of early fixed shooters such as only having a single shot on screen at once, but once you’re accustomed to the fact that this is a game that demands accuracy rather than an itchy trigger finger, there’s some addictive gameplay that will keep you coming back here. Also, isn’t it fun to shoot things that aren’t aliens and spaceships once in a while? 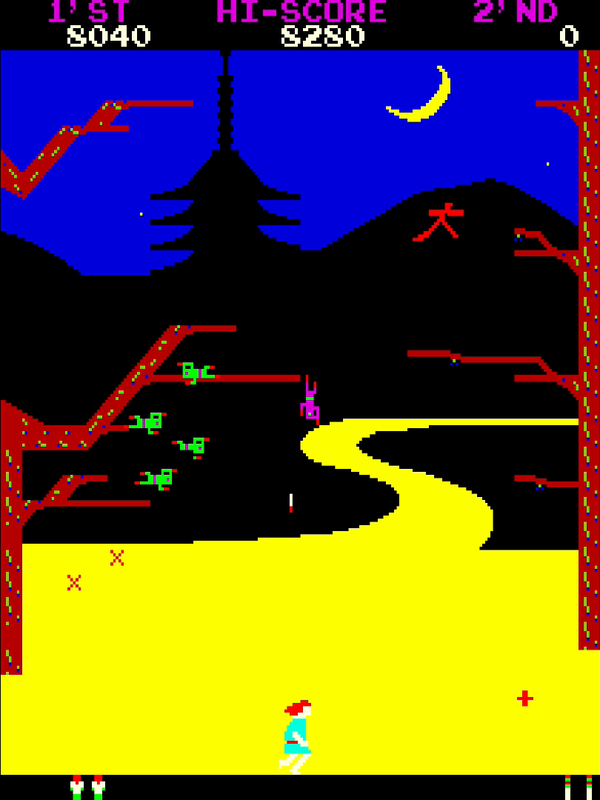 Visually, I always feel like this game bears a resemblance to Satan’s Hollow (which came two years later). Yes, I was immediately struck by that fact too. There are some mechanical resemblances, too — the “fire” attack that the red commander does is quite similar to one of the bosses in Satan’s Hollow.